Chances are that you have seen straw art at some point in your life whether you recognized what it was or not. The crafting of grain, cereals and grasses into items is a global tradition spanning centuries. Items made by different cultures (South America, Africa, Europe, etc.) vary, but many of them were practical such as hats, baskets and floor mats. Others include decorative items and even talisman to ward off evil or bring good luck. For many cultures the tradition started as part of their harvest celebrations. Sadly, Jean Whipple of Olympia explains to me that the art is dying out. She has been a member of the National Association of Wheat Weavers since 1995. When she joined, there were approximately 400 weavers. Now, they are down to 240-250. Jean Whipple has ties to Sweden and Germany through her grandparents on both sides. Her mother’s parents emigrated from Sweden following the promise of a better life like so many others. “My mother was the first born in America, and they did not speak Swedish,” Jean says. “My grandparents did not speak it with them. They wanted to be Americans. And, when my mother went to kindergarten, she brought home a note that said, ‘You must speak English at home.’” She added that this meant they did not keep their Swedish traditions either. This was the case for many families, not just Jean’s. 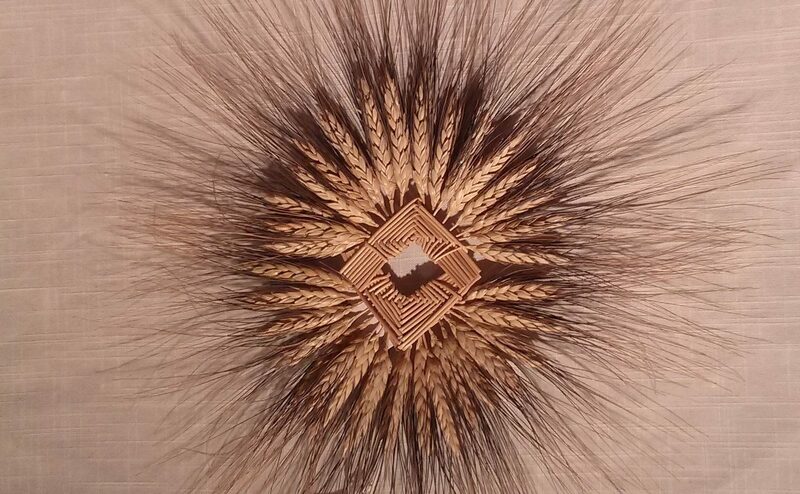 Her grandparents passed away when Jean was six-years-old; however, she remembers seeing the Scandinavian wheat art they had brought with them. Jean would see those designs again while attending Luther College in Decorah, Iowa, which has a Norwegian community, after leaving her hometown of Chicago. “When you would walk downtown, you would see the wheat art in the windows, and it always intrigued me,” Jean explains. In 1974 Jean moved to the Pacific Northwest for a teaching job. With degrees in music and Spanish, Jean taught high school for many years. She also lived in Mexico for two years as well in order to “live la vida loca,” she laughs. Finally, in 1990 she came across a wheat art kit at The Barn Nursery in Olympia that had simple instructions to make an ornament. “I had three toddlers at the time, and it was a craft I could do and get up and chase them if I needed to, not like sewing,” she explains. Six years later, Jean started doing shows in the area, but she says people did not know what it was. “I didn’t know anything about marketing or what I was doing,” Jean laughs. “I would get excited about making $80 in two weeks. I was just dabbling.” Then she did a Christmas show in Aberdeen and noticed the smaller pieces just did not show up well with the way they were displayed – so she learned a bit about marketing as she went. She did a few more bazaars and then started to brainstorm about a better place to sell her Scandinavian craft. That was 22 years ago. She has a large, eight-foot wall space in the gallery with plenty of designs available to purchase at any time. Over the years Jean spent five years on the board. 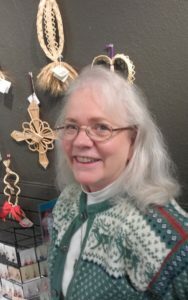 She also continues to do the Scandinavian Fairs in Washington and Oregon, including the Norway Hovedstad Lodge’s annual Norwegian Heritage Festival (Norway Day) at the Thurston County Fairgrounds in April. Jean acquires her materials from all over, including local grasses from property she owns in the Black Hills. But you cannot use just any material. “Out of the seven grasses I have up there, one will take a soak and work,” she explains. She says the important thing is that not only do the shafts have to be tough but also become palpable after being soaked in water without breaking. She loves to work with Blackbeard wheat because of the color it adds to the designs. Jean is not just preserving the art by doing it herself; she also encourages others to take it up and teaches classes throughout southwest Washington. Most of these classes are through local lodges, such as the Sons of Norway or Daughters of Norway and through Pacific Lutheran University’s Scandinavian Cultural Center. To learn more about wheat weaving, visit the National Association of Wheat Weavers website. 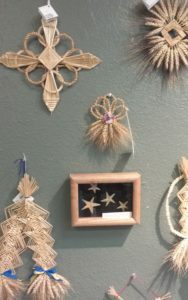 If you would like something made by Jean or to learn about her upcoming classes, you can visit the Verksted Artist Gallery or contact her via email weavinwhipple@gmail.com or phone her at 360-866-0888.